John Rice Irwin spent a lifetime collecting the artifacts of the Appalachian people and although the museum’s founder is now retired, he can still remember just about every auction, every smokehouse and barn he has explored–and every good friend that he has made among the rural folks of Appalachia. Those histories–and the people to which they are connected–are central to his passion for collecting and central to the character of the Museum. 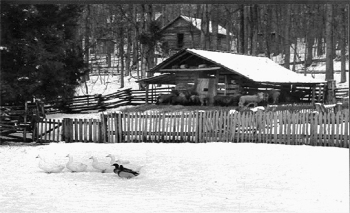 It was the familiar story of the devastating Barren Creek flood–legendary in East Tennessee for churning past the banks of the Clinch River in the dead of night and sweeping many people and hundreds of farm animals to their deaths–that led to one of his earliest purchases. The purchase, made at a local auction, was just an old, worn, poplar horse-shoeing box, but the auctioneer mentioned in passing that it had been fished out of the nearby Clinch River over half a century earlier, following the catastrophic flood. After that purchase came many others, sometimes at auction, sometimes from making trips over dirt tracks and going door to door. Earning the hard-won trust of rural folk is never easy, and John Rice will tell you that it was his knowledge of and curiosity about old-time farm implements that often opened the door to friendships. But conversations with him begin to draw a larger picture, one where it becomes clear that it was—and continues to be—his admiration and esteem for the ingenuity, craftsmanship, and hardy perseverance of the people of Appalachia that has allowed him to forge relationships of trust and mutual respect. The purchase of several truckloads of early Appalachian artifacts from Bill Parkey of Hancock County reveals just such a relationship. Bill’s family had lived in Rebel Hollow near the Powell River for generations, settling there before the Civil War, and the old homeplace had a wealth of early tools and equipment that he continued to use for blacksmithing and wagon-making. For years, John Rice had been told that Bill would never part with his beloved tools for any amount of money. 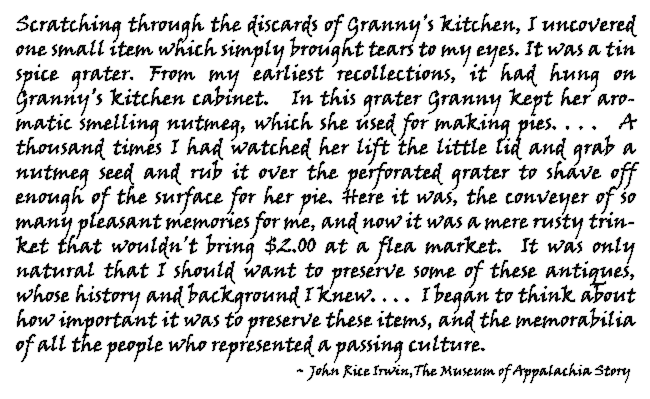 The warnings largely were correct, for although John Rice occasionally was able to purchase a thing or two, his trips to “Revel Holler” were generally spent just visiting with his friend. It was only after Bill’s death that his widow called John Rice, saying that Bill had told her never to sell his cherished tools unless it was to “the professor”—because John Rice had “always treated him right.” It is illustrative that John Rice insisted on paying Mrs. Parkey twice her asking price for several truckloads of her husband’s tools. The Museum has been featured in dozens of other national magazines and has been the subject of articles in virtually every major newspaper in the country, and several articles in foreign newspapers as well. Thousands of people from every state in the union and many foreign countries view this splendid preservation of Southern Appalachian life each year, and the official Tennessee Blue Book has described it as “the most authentic and complete replica of pioneer Appalachian life in the world.” The American Automobile Association’s Tour Book rates the Museum as a “Gem,” and our Tennessee Fall Homecoming has been named one of October’s Top 20 Events in the Southeast by the Southeast Tourism Society. The Museum of Appalachia’s history is a proud one, grounded in a profound respect for the tenacity and indomitable character of a region. But it is a living history: it preserves an essential spirit of the past while it continually seeks to educate, entertain, and interpret for the present. From John Rice Irwin’s earliest acquisitions has grown a vibrant place of creative activity, careful preservation, and loving commitment to a people and a region.